Weeks of snowfall in the northwestern US and western Canada allowed for numerous deep opening days this past week. Coming up, warmer air will invade during the next few days, driving up snow levels with rain at many mountains. Fortunately, the warm weather will only last about one week, with colder and snowier conditions likely returning by early next week. So far this season, Mt. 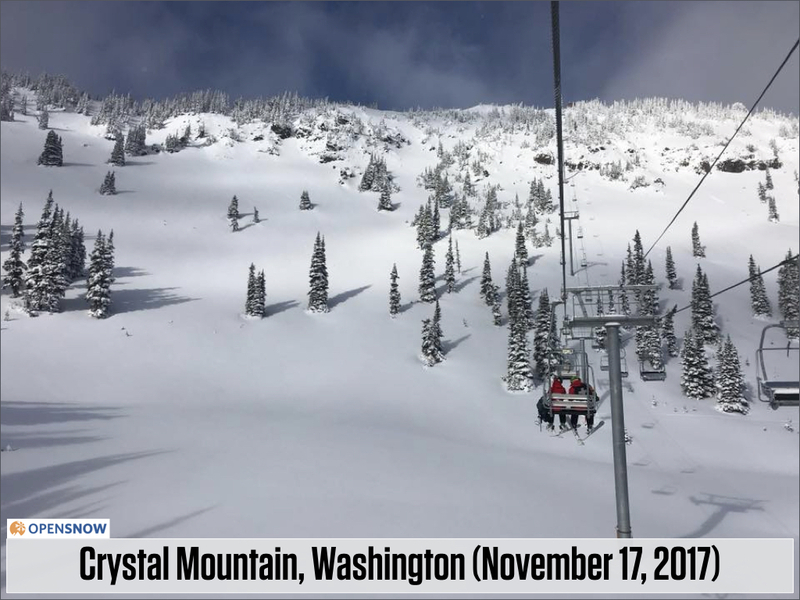 Bachelor (Oregon) has measured 113 inches of snow, and Crystal Mountain (Washington) has measured 59 inches. Snowfall totals like this, by mid-November, allowed these resorts and a few others to open for skiing during the last few days. 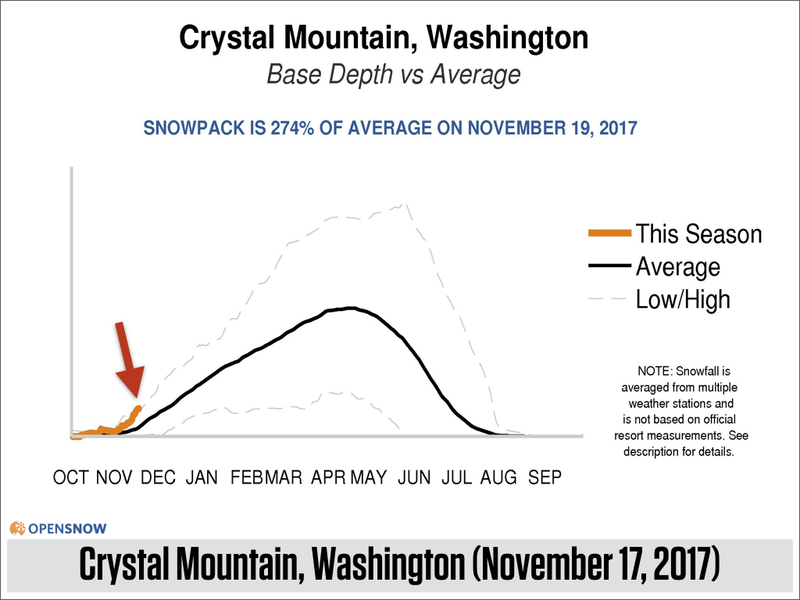 The snowpack at Crystal Mountain is impressive, coming in around 274% of average for this date. The scene looks like mid-winter. This picture was taken one day before the area was open to skiers and riders. Elsewhere, a storm brought 6-12 inches of snow to Colorado and Utah at the end of last week, but the snowpack in these states still lags well behind their neighbors to the north and west. 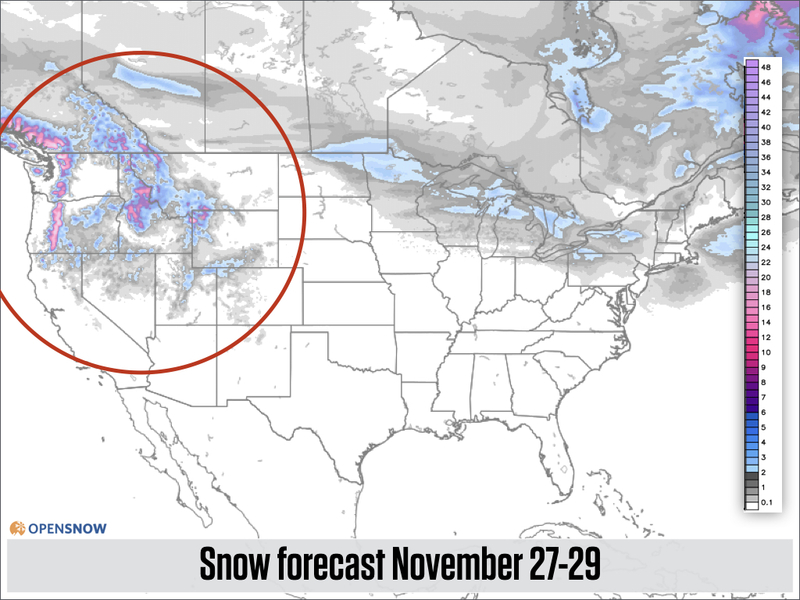 Looking ahead to the weather for the upcoming week, at first glance, it appears that more snow will fall in the Pacific Northwest, which is the area that has seen the most snow this winter. 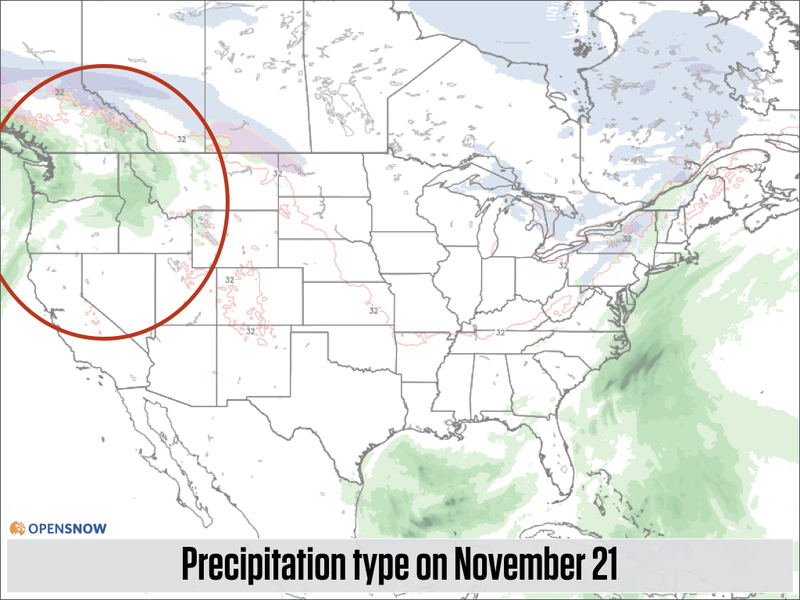 However, the map below, which shows the type of precipitation, is filled with green in the northwest, indicating rain for all but the highest elevations. Boo! 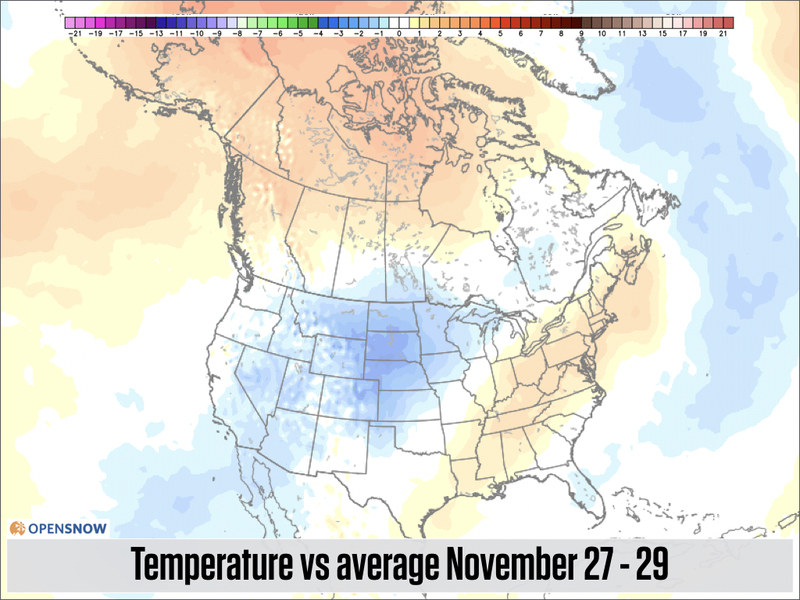 When we look at the temperatures compared to average, the forecast for this week shows readings 5-10+ degrees warmer than average throughout the west, including the Pacific Northwest. These warm temperatures will push snow levels up to 8,000 - 10,000 feet, which is near or above the summit elevation for most mountains in the northwest (interior British Columbia and Alberta could see snow levels that are a bit lower). High snow levels are a no bueno, but as our northwest meteorologist often points out, while skiing in the rain is not the most fun and this will likely not be a great week to ride, rain-on-snow events are not as destructive to the snowpack as you would expect. The good news is that the warmer weather should only last for about one week. 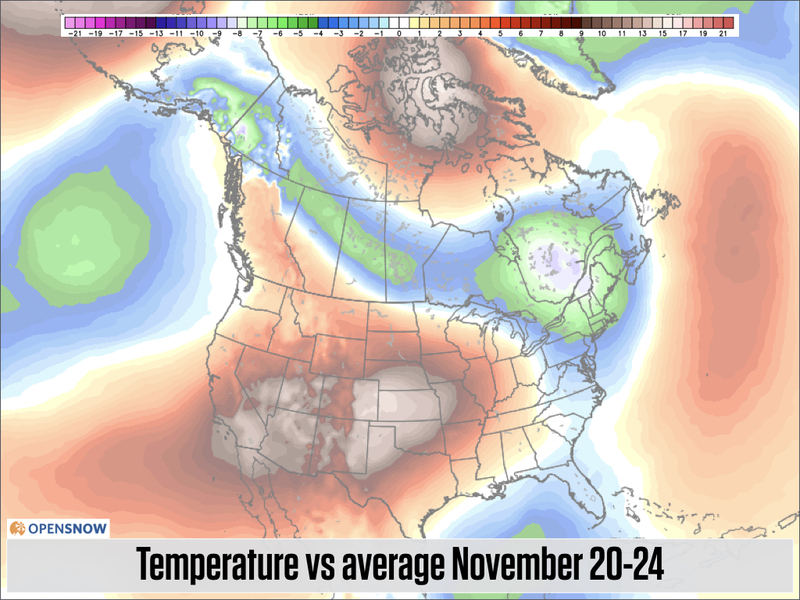 The forecast for next week, the final week in November, is for below average temperatures to return to the west. 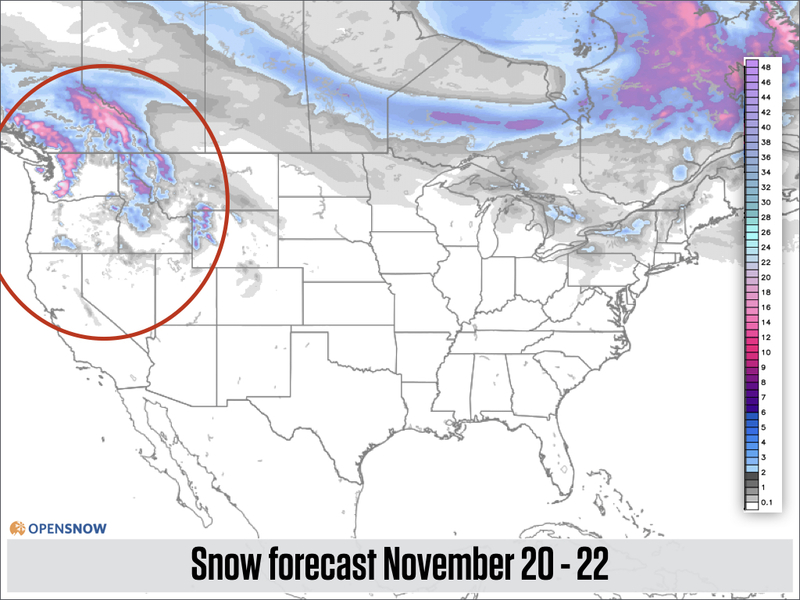 This means that snow will return to the forecast from the Pacific Northwest through the central Rockies by the last few days of November. Some of the longer-range models indicate that this cooler and stormier weather could stick around the west as we head into December. I hope that is correct, but I don't bet the farm on 15+ day weather forecasts. Thanks for reading, and stay tuned for my next update on Sunday, November 26th. Joel is the Founding Meteorologist of OpenSnow and has lived in Boulder, Colorado since 2003. Before moving to Colorado, he spent his childhood as a (not very fast) ski racer in eastern Pennsylvania.